These New Shoots from Kentucky’s Leslie Blackford may make you smile. 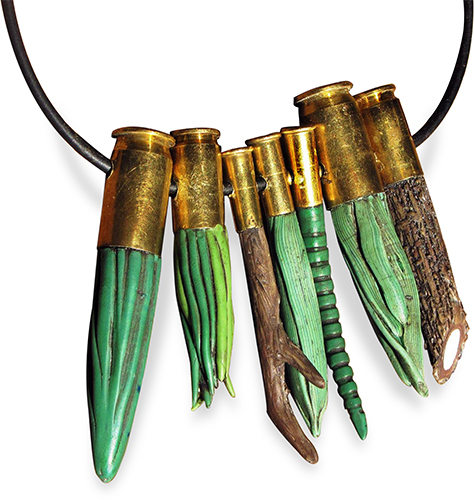 She combines found shell casings and polymer into a hopeful, bittersweet visual pun. The tag line on her recently updated web site says, “For those seeking out the odd and unusual.” Her work champions outcasts and unloved characters and somehow she makes their oddness endearing. Leslie has a raw talent that doesn’t rely on technique. Her fingers put her heartfelt sentiments into the polymer and she is able to communicate keenly through her work. Her themes often center on animals and ephemera found in Kentucky’s moody woods. Her Pinterest page may amuse and delight you too. Wow, I am always amazed with the talent out there! Hey! Thank you Cynthia . What a nice surprise and such an honor to wake up to this morning. I have been a bit stir crazy, being cooped up during this very cold winter and this post has warmed my heart. I am personally NOT a fan of guns but I happen to be in a place where people were target practicing and I saw all those shiny little shells all scattered about and Now I can’t stop filling them with clay. Thanks for the lovely comments,Shelly. Miss you too Jan . And Wendy , I miss you and I am so excited about our new project! Cynthia , cant wait to see you .